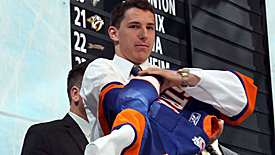 Ryan Strome puts on an Islanders jersey on stage at the 2011 NHL Entry Draft in St. Paul, MN. Ryan MacInnis debuted in the OHL this past season, scoring 37 points (16G, 21A) for the Kitchener Rangers after playing one year in the USHL. MacInnis is 6’3”, an attractive attribute for a center, but weighs a lean 183 pounds. Scouts praise his two-way game and cite his enthusiasm to hustle back and help in the defensive end. The St. Louis, MO, native is the son of Hockey Hall of Famer Al MacInnis. Big, tall, rangy left-handed shot. MacInnis does everything well and plays a solid two-way game. He has a lot of tools that are very good. Linus Soderstrom continued his ascent up the Djurgarden ranks, appearing in 23 games in 2013-14. The Stockholm, Swe., native posted a respectable 2.61 goals against average and a .915 save percentage, but scouts see his size as an upside. Soderstrom is 6’4”, 194 pounds, is light in his crease and can get around the net. Another big Swedish kid who gets himself square to the shooters and follows pucks into his body well, limiting rebounds. Has a calmness about his game that shows he plays under control. Brayden Point scored a career high 91 points (36G, 55A) in 72 games during his sophomore season for the Moose Jaw Warriors. Point shattered his previous highs (24G, 33A) and was the 13th leading scorer in the Western League and second among players on non-playoff teams. Point stands 5’9”, 160lbs., which is a concern for some scouts, but smaller players are playing a bigger role in the NHL in recent seasons. Point is a smaller, skilled center-man that really understands the game well. He is a heady player with vision, hands and above-average hockey sense. Has the ability to utilize his teammates on the ice as options to create chances. Shows the ability to make players around him better.